The 4DTV Integrated Program Guide is an integral part of the receiver's charm and ease of use. It was also a key selling point of the box. The IPG should be trouble-free, but unlike other IPG products, this one must take the data and run. In order to check out IPG problems, you need to "Demand" a guide download. Dish will move to G0 if it is not already there and you have a subscription to the IPG. A properly functioning IPG will have distinct characterisitics. by checking these areas, one might isolate the problem. First, you must be subscribed to the IPG. Beginning 1/1/2001, the IPG is now a PAY ITEM. The 4DTV will not tune to the guide at all if you do not have a subscription to it. Instead, it will simply bring up the guide bar at the top of the screen and will not tune to the guide channel. If this happened to you, check with your programmer to see if you are explicitly authorized for the guide. Get a Subscription or a Re-hit if this is happening to you. Second, it will tune to the right spot to retrieve the IPG. 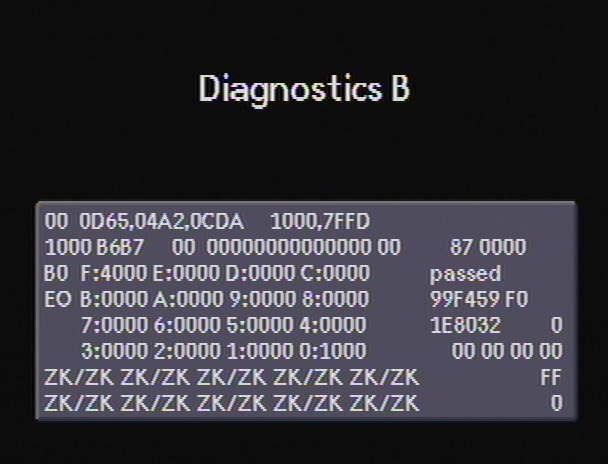 and Diagnostics C for the other things. g) note the number is 07. This means a DCII Lock when tuned to a DCII channel. Confirm by looking at the front of the receiver for the Green DCII Light. h) Look at line 3, on the right. l) the 1 is the Channel Catalog number. 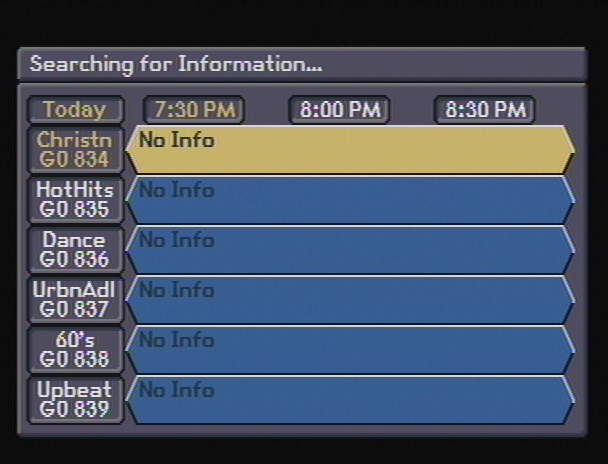 All Channels listed in the IPG have unique number. The actual number 1 means channel is the IPG. m) the 50 is the Service Number. The service number is used to differentiate between channels in a DCII multiplex. n) the 1270.000 is the I.F. frequency value. 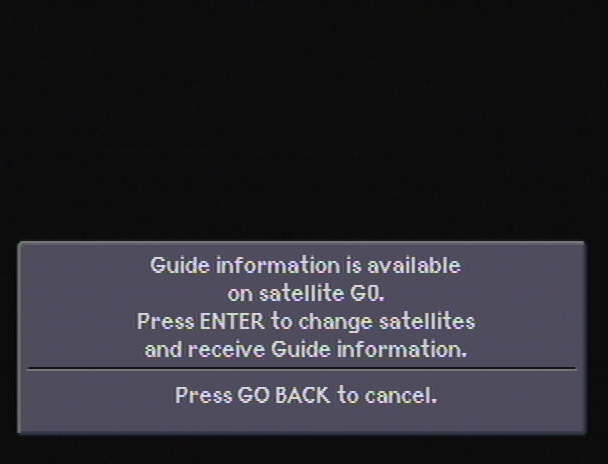 Failure at this point indicates no guide authorization (see note above), bad channel maps or No Signal. See: Fixing the maps. If you are certain the maps are correct, check Options 5 for good signal/quality levels and the front panel for a Green DCII lock light. Adjust as necessary. If the status is US/US, NS/NS or MP/NS you do not have authorization. Additionally US/US may mean a bad signal or bad channel maps. The Fourth item: An opportunity. 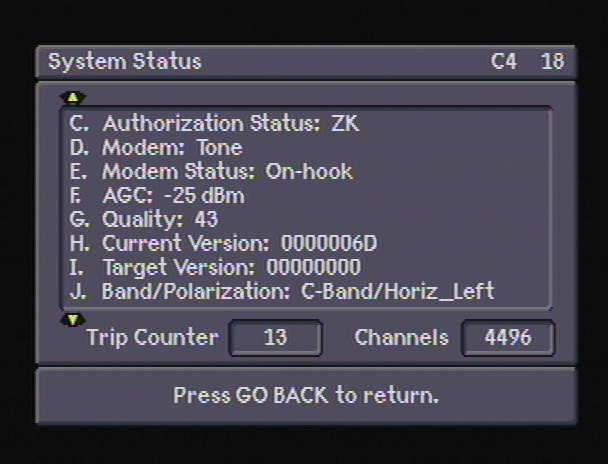 The 4DTV is made to automatically tune to G0 during the night while the receiver is OFF. You may disable this setting with options 642. Additionally, it will not automatically tune to G0 if you do not turn off the receiver at night. and it stil doesn't update, the data stream itself might have a problem. 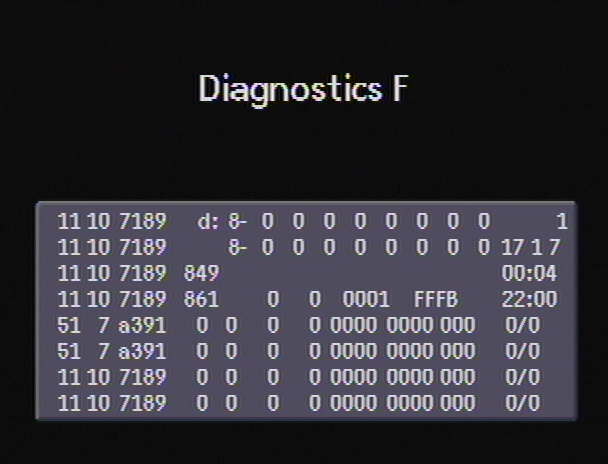 Diagnostics F will tell you if the stream is ok. 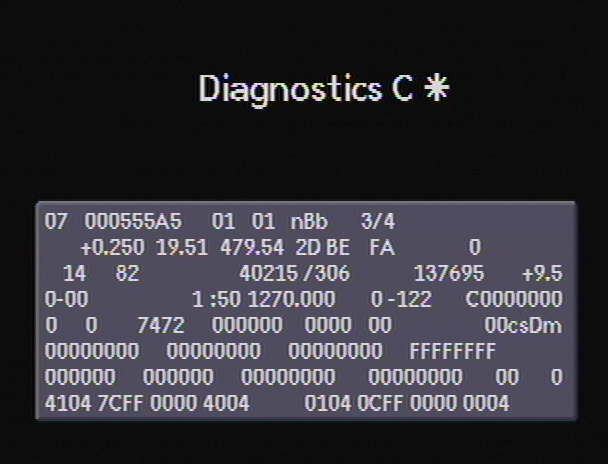 If the stream is OK, Diagnostics F will look like the display below. A good running data stream will cause the numbers in the rows after the d: to update. Below the d: you see a 15. A number in this spot corresponds to the number of unreceived/rejected packets. The lower the number in this spot, the better. Below the 15 is a number 861. A number in this spot corresponds to the number of total IPG packets. The next 4 lines below the 56 and the 12 represent data. 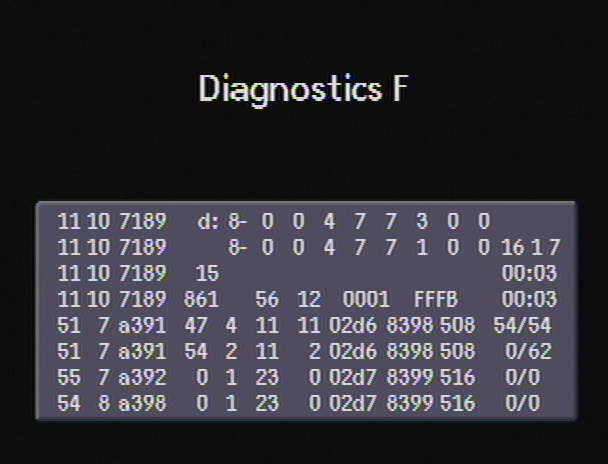 Diagnostics F during normal guide retrieval. Additionally the number 849 is a dead giveaway that something is very wrong. Press the Info button to try to restart the IPG collection procedure. Call G.I. and tell them that the IPG is down. "Your Satellite Provider" , NPS or HBO Direct among others, will $ell you a guide subscription, likely as part of a package.